I’ve been on this Asian food kick lately, so apparently this week I was wanting something different. From stir-fry to spicy noodles to sushi, I’ve been craving all of it. 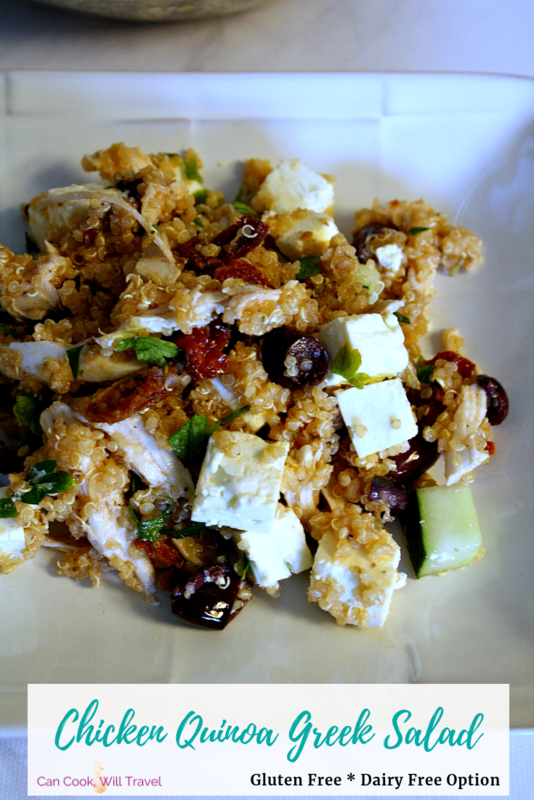 Yet this week I really had this idea to make a Quinoa Greek Salad, which was a bit out of the norm. Lately when I’ve eaten out with my boyfriend or friends, it’s been pizza, bar food, pasta, or Asian cuisine. And I’ve really been feeling pulled to start watching what I’m cooking at home more. I try to cook healthy, but I’ve also been packing on a few pounds (thanks a lot pizza & beer!). So in an effort to get back on track, I’m making working out and clean eating my new priorities. So yoga and running (yes, I said I’m running and actually don’t hate it) are a big part of my week. I don’t remember the last time I cooked with Greek flavors, but it was clearly time. And I COULDN’T seem to get this couscous salad I made years ago out of my head. But I wanted something gluten free that was a bit better for me, since couscous is pretty much like eating pasta. So I took that idea and did some ingredient swapping and came out with this Quinoa Greek Salad that is INSANE! So Monday I totally threw together this dish on a whim with zero plans. 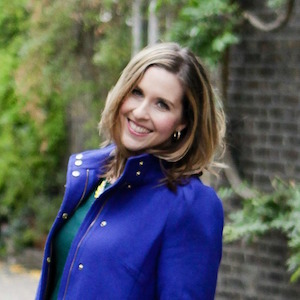 And it turned out so great that I didn’t think twice that it deserved a spot here on the blog. You can totally customize this by skipping the chicken or opting out of Feta to keep it dairy free. The recipe came together in about 30 minutes, which is always a plus. The chicken and quinoa took about 20 minutes or less, and the rest is mainly chopping. That part is done while the cooking happens or right after, so it’s a piece of cake to make! Chicken: I poached my chicken, and while I only used 1 chicken breast for this recipe, I poached 3 at once. Then I shredded the other 2 pieces to use later in the week for a stir-fry or Asian noodles. Quinoa: I cooked the quinoa and water along with some tomato paste, dried oregano, and salt. Stir it all together as it boils, and then cook according to the package. Veggies: While everything cooks, chop the cucumber & olives for the Quinoa Greek Salad. Then set those 2 aside along with the sun-dried tomatoes until the quinoa is ready. Put it All Together: Once the chicken is cool enough to shred, add 1 shredded chicken breast along with chopped parsley and diced Feta to the quinoa and veggies. Stir it all together with some EVOO, Red wine vinegar, and salt and pepper to taste. My favorite kind of Feta cheese is the kind you buy in a big block. I got mine at Trader Joe’s, and I just patted any liquid off of it with a paper towel. Then I sliced it down the center length-wise, and then cut it into pieces. That way I had more opportunities for cheese in every bite of my Quinoa Greek Salad. This dish makes a ton of food, so I’ll easily get 4-5 meals out of it. And all of the Greek flavors I love are perfection! You get the tart olives & sun-dried tomatoes to add a kick, crispy cucumbers for a nice bite, and salty feta along with hearty chicken. The quinoa has great flavor and the light dressing of EVOO & vinegar lets all of the ingredients shine. I loved adding flavor to the quinoa as it cooks, because quinoa can be pretty bland. But that’s why I enjoy cooking with it, so that it works well with lots of flavors & cuisines. In this case I added tomatoes & oregano to give a slight Greek nod of flavor. 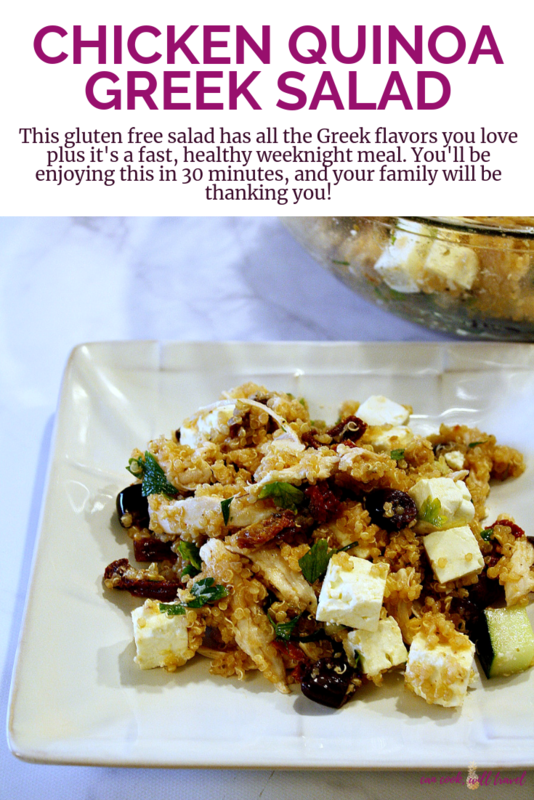 I cannot WAIT for you to try out this Quinoa Greek Salad for yourself. I know you’ll be digging it as much as I do, so click that link and you’ll have all the step by step photos. Happy cooking!! This delicious meal is crazy easy to make, gluten free, and dairy free if you skip the Feta. Enjoy! Chicken: Start by bringing a large pot of water to boil, and then add the raw chicken to the water. Remove the pot from the heat, cover, and let the chicken poach for 20-25 minutes. Place the cooked chicken (I like to cut through the thickest part to make sure it’s cooked) on a plate and then shred with your hands once it’s cool enough to handle. Quinoa: In a saucepan, add 1 cup of quinoa (that you’ve rinsed), 2 cups of water, 1 T. tomato paste, 1 T. dried oregano, and a pinch of salt. Bring it to a boil, stir, and once it’s boiling, reduce the heat to low, cover and simmer for 15-20 minutes. Once all of the water is absorbed, transfer the quinoa to a large bowl. Prepping Ingredients: While the chicken & quinoa cook, chop the cucumbers, olives, and parsley. You can also measure out the sun-dried tomatoes too. To Finish: Add the cucumbers, olives, tomatoes, shredded chicken, parsley, 2 T. EVOO, 2 T. Red Wine Vinegar and salt and pepper to the quinoa. Combine really well, and taste and add more salt or pepper if needed. 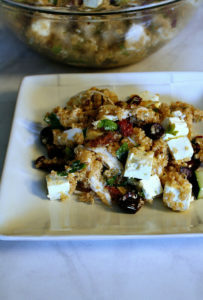 Then dice the Feta into bite-sized pieces, and gently stir it into the quinoa. Enjoy right away and you can eat it cold or warmed up! 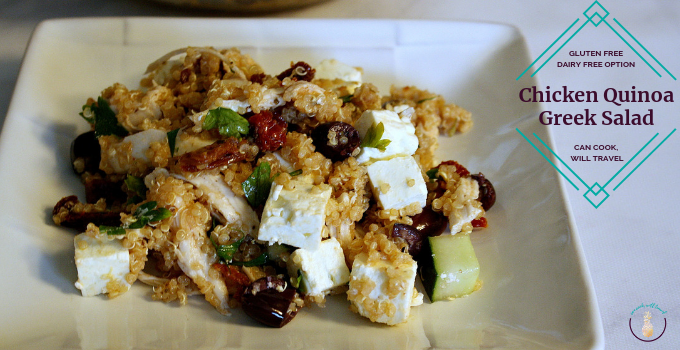 Quick Tip: Skip the feta to keep this dairy free, and it'll be delicious either way! One year ago: Kale Artichoke Dip is Healthy Snacking Perfection! Two years ago: 5-Spice Fried Rice with Sweet Potatoes is Lovely! Five years ago: Hola Chicken Tamale Casserole!